…I think it might be the crispy bacon. Or maybe the caramelized onions? 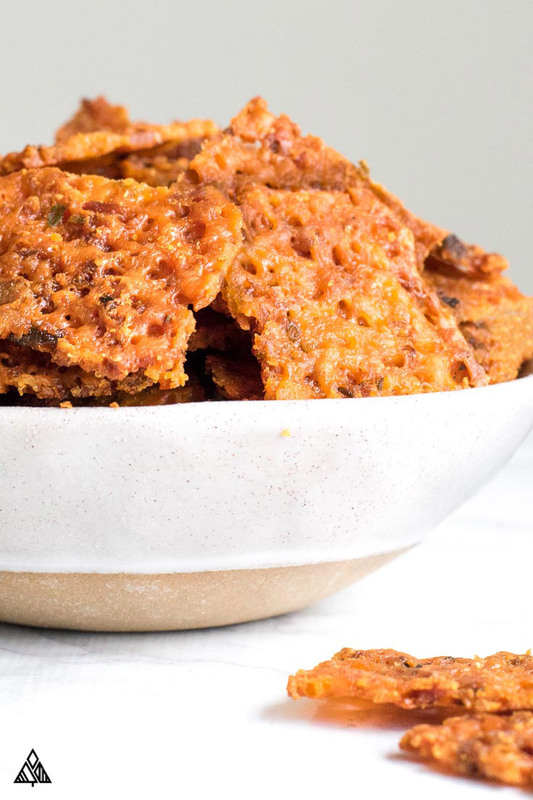 Either way, the crispy, crunchy texture combined with the salty, delicious flavor make these low carb chips a household necessity. Perfect to grab on the go, perfect as a movie snack, really, is there ever a bad time for cheese chips? If you only have a few minutes to spare, and cheese is the only ingredient in your fridge, this is one of the low carb recipes you can still make! Crispy cheese is as simple as tossing flattened mounds of cheese on a baking sheet lined with parchment paper and into the oven until it’s nice and crispy. But, if you’d like to get fancy with me and have 10 extra minutes to spare, then follow my recipe instructions below. Typically, cheese crisps are made with a sprinkle of herbs or spices. But this ain’t my first rodeo. 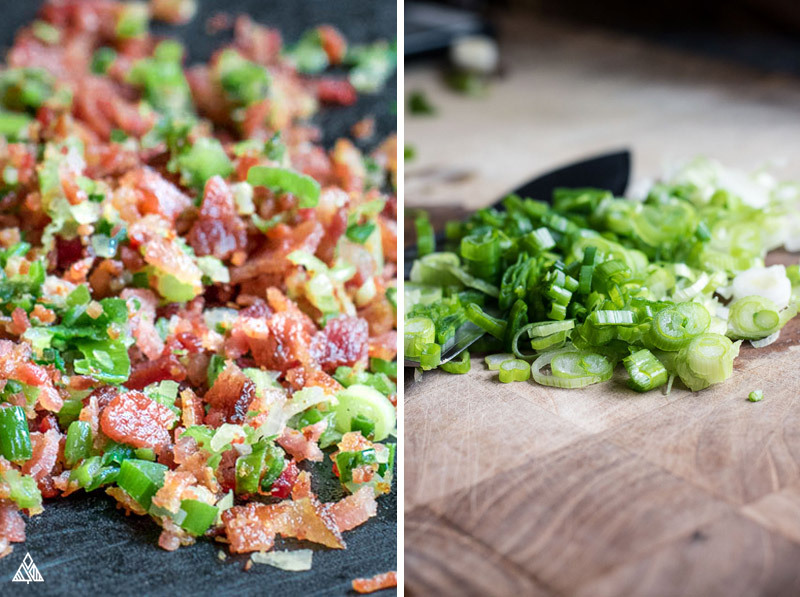 So, I took it up a few notches by adding bacon and green onions—because what goes better with cheddar than green onions and bacon?? Most crisps are small round 4 bites worth of a “chip”—which is made my creating small mounds on a baking sheet, as described above. Instead of forming this traditional shape I placed all the cheese flat onto a baking sheet. Once the cheese melts together, you basically get a giant, flat sheet of ooey gooey goodness. While the cheese cools, I take a pizza cutter to cut the chips in to whatever shape I’m feeling. You can make squares as I did here, or triangles for low carb tortilla chips. If you’d prefer a traditional “crisp” shape, then make small mounds of this cheese combo on you baking sheet! I’ve heard rumors of people making keto cheese chips microwave method. I don’t have a microwave so I can’t advise, but if you try it, let me know below! Is the Cheese Flexible? Parmesan Chips Anyone? Why yes, since there are such few carbs in cheese, you can use any kind of meltable low carb cheese you’d like in lieu of the cheddar in this recipe! 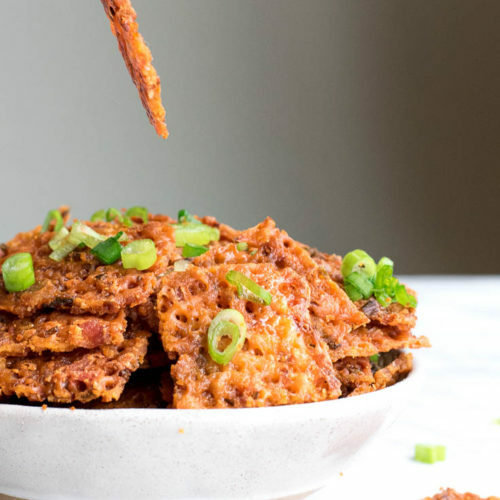 I’m sure you’ve seen dozens of parmesan chips recipes floating around, and for good reason! 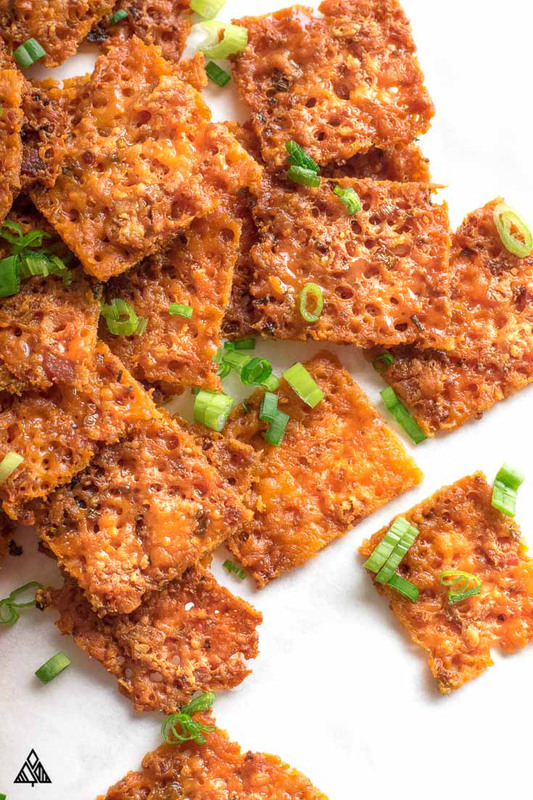 Parmesan crisps up into the perfect cheese chip, where many other varieties of cheeses are unable to crisp — plus, if you’re all about protein in cheese, parmesan has more protein than most varieties! Cheeses that won’t crisp the same way are wetter variety of cheeses; think cream cheese, fresh mozzarella, feta, halloumi, etc. Have fun with this recipe! Try whatever cheese you have in the fridge — from mozzarella cheese chips to keto cheese chips sargento cheese! Keep in mind baking times vary depending on the moisture content of each cheese. For example, parmesan has less moisture than cheddar and takes less time to crisp. Allow the parmesan crisps to cool on the baking sheet or otherwise, then place them in an airtight container and into the fridge. Unfortunately, this will take away some of their crunch factor—which you can quickly bring back by baking them in the oven for a few before enjoying them as a snack. I’ve even stored baggies of these in my freezer. Defrost frozen crisps the same way you would heat them up from the fridge. Top a low carb casserole with a handful of these. Serve them on a plate by themselves—delicious on their own as a low carb appetizer, or in between low carb meals! 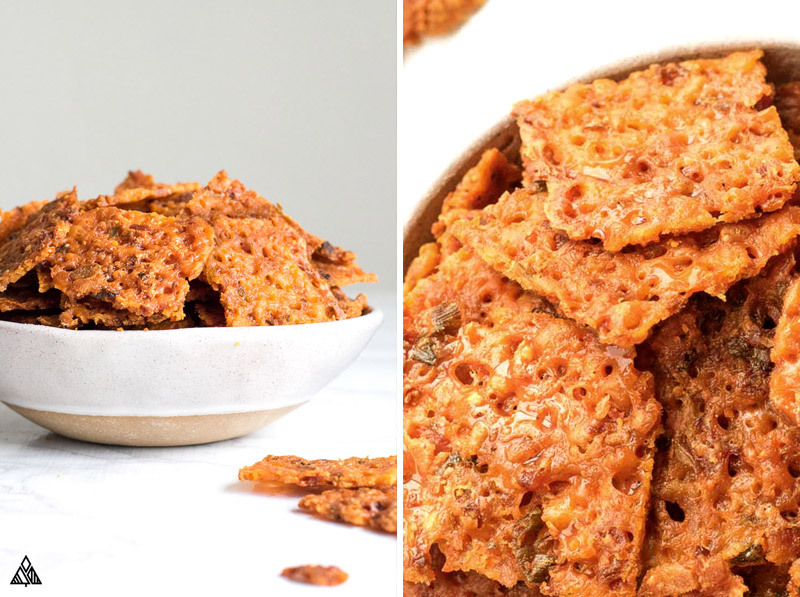 If you had a different type of cheese crisps in mind, then check out a few of my other cheesy (one not so cheesy) favorites, all made from low carb shopping list items! My parmesan cheese crisps are a little less labor intensive, but not less flavorful. Made with parmesan, pesto, and crushed red pepper. Parmesan cheese chips are a snack everyone will love! Here’s you cheese free option: low carb crackers made from almond flour, butter, and herbs. So, you can place a slice of cheese on top of your cracker without feeling weird about it. Without further ado, here’s my favorite cheese chips recipe! 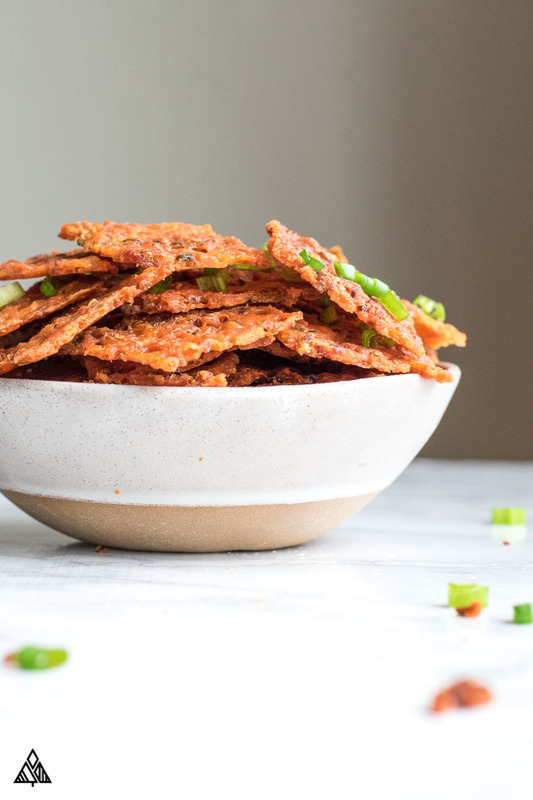 After trying this low carb recipe, you’ll wonder why you ever wasted a carb on boring old potato chips. Let me know what you think in the comments below. Happy baking! 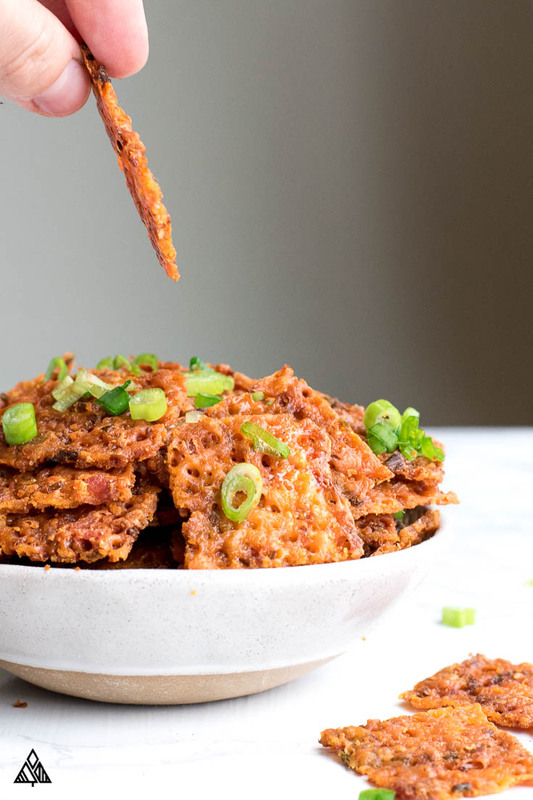 Sautéed onions and bacon may outshine the cheese in your new favorite, perfectly crunchy low carb snack: Introducing 3 Ingredient Baked Cheese Chips! Cook bacon in a pan. Once done, remove from the pan and place on paper towels to soak up the grease. Chop green onions and cook in the bacon fat. 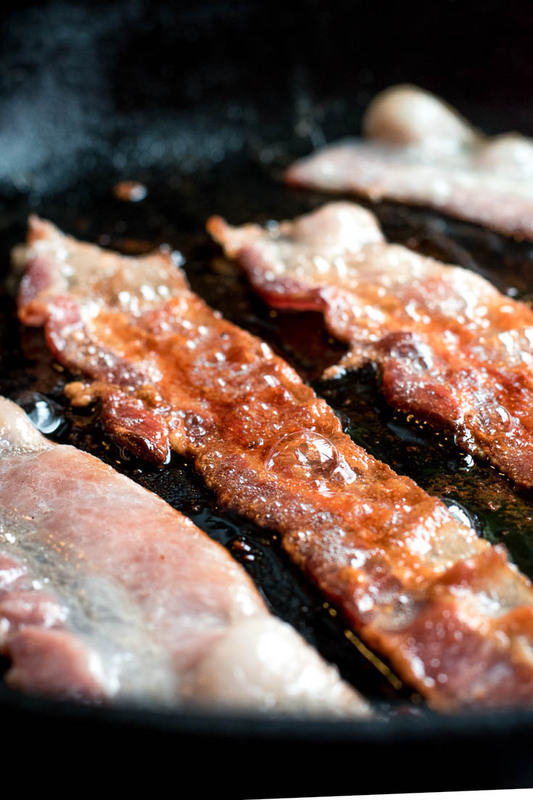 Allow bacon and onions to cool and drain in a paper towel. Then place them on a cutting board and mince them. Add this to a bowl, and combine with the cheese. Spread the cheese mixture onto a baking sheet lined with parchment paper, this should be a thin, even layer (you can use the bottom of a pot or pan to level the top). Bake for 16-18 minutes, or until the chips look crispy. Take chips out of oven, and allow them to cool for a few minutes until the cheese stops bubbling. Then place a good amount of paper towels on the top. Carefully, drain excess grease from pan, then flip, so the parchment is on top and the paper towels are on the bottom. Place on a cutting board. Remove parchment paper, and replace with paper towels. Allow the cheese to cool until it has hardened. Then using a pizza cutter, cut to your desired shape. Enjoy! Pst, if you’re not in a cooking mood, there are plenty of cheese chips brands, check out the cheese chips Walmart sells, or the cheese chips Costco to get some ideas! Just made these wonderful chips. Made a double batch. They were wonderful!! I will be making this over and over again.